Fuoco di Napoli has closed in Buckhead. Fuoco di Napoli opened last December on Pharr Road in a space that had then most recently housed McTighe's, a local bar. When the restaurant opened, the traditional Neapolitan pizzas were made by Enrico Liberato, previously of Fritti, Antico Pizza and Max's Coal Oven Pizzeria. Liberato was been hired by the McDowell family to be their pizzaioli to attempt to recreate the popularity of Antico Pizza. The McDowells had apparently already worked with Enrico before, at Antico no less, when they partnered with Giovanni Di Palma for "Antico Express," a food truck. The McDowells (then only Lori and Dino) purchased precooked pies from Antico and then sold them either as pies, or by the slice, at events around the Atlanta Motor Speedway. During this time, D.H. McDowell Family LLLP owned a 20% stake in Antico Holdings, during which time they had “access to and knowledge of the Antico Trade Dress and Trade Secrets used in connection with the operation of Antico Pizza.” D.H. McDowell Family LLLP sold its share of Antico Holdings on May 6, 2011, for roughly a quarter of a million dollars. In March of this year, Liberato was booked on a number of charges including aggravated assault and an immigration charge that apparently led to his deportation. Fortunately, he had been training the McDowells and their employees on how to make the pies perfectly. In April, Giovanni Di Palma via Antico Pizza Napoletana filed a federal "intellectual property - trademark" lawsuit against Fuoco Di Napoli. The lawsuit named not only Lori and Dino McDowell, but also Jackie and Dennis McDowell, as defendents, but not Enrico. The lawsuit also alleges that the defendants intentionally misled consumers to make them think there was a connection between the two pizza shops. 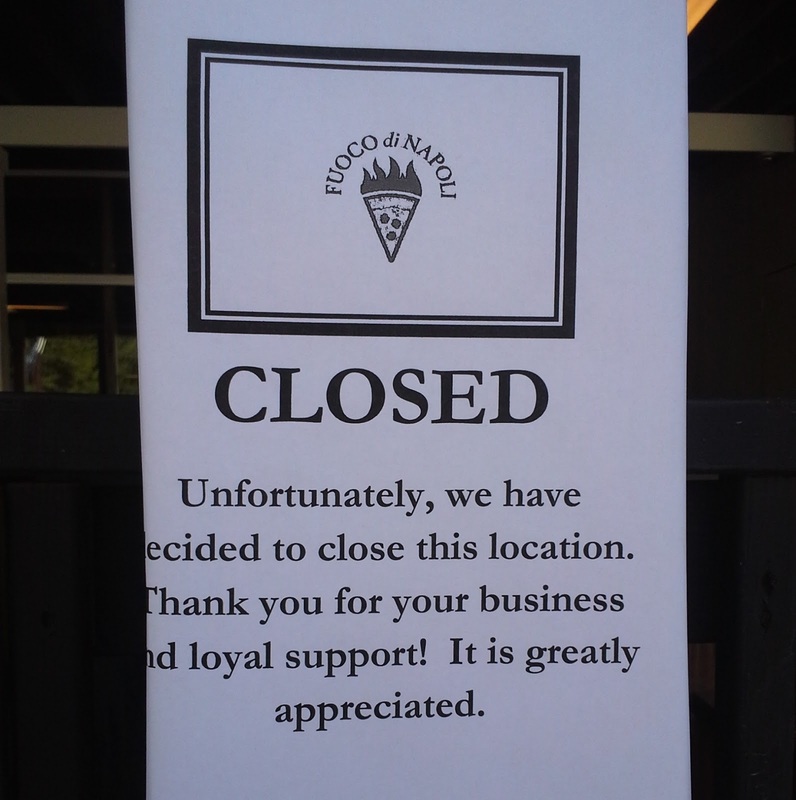 The restaurant seemed to be doing ok, not as well as Antico, but not on the verge of closure. 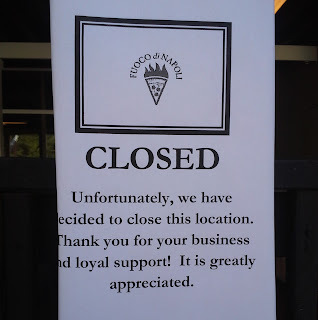 Apparently it closed Tuesday night, but according to the restaurant's Facebook page, it will be "expanding its offering of authentic Neapolitan pizza to retail locations very shortly." What do think of all this? Do think the restaurant's closure was related to its legal battle with Antico? Would you buy Fuoco's pizza from a "retail location?" Where is your favorite pie? This restaurant was not doing ok. I must've visited 6-7 times since April, and I'd never seen more than 3-4 other patrons inside, even at prime times. I think it was popular at first, but then people just stopped coming. I thought the pizza was definitely better than nearby Fellini's, but not up to Antico standard. It was a great neighborhood pizza joint, but I don't think the neighborhood needed two. A nice memory was a couple months ago when my kid nephews were visiting, and the cooks invited them behind the glass to make their own mini pizzas by hand. This was a completely awesome gesture that those kids will remember. I will miss this place. Ugh. Food is a tough business, as if anyone didn't know. I liked Fuoco a lot - pizzas very close to (on some days, even better than) Antico. Plus, it wasn't all the way down on the Westside. I like the Westside a lot, but if you live in north Buckhead, it's a haul. I sure hope they reopen soon. Stopped in when they first opened. Two of us got salads and shared a pizza. I got food poisoning... lost two days of my life... the only difference in what we ate was the salads, I had all the tomatoes; cherry tomatoes, cut in half. I've wondered if they got cut with a knife used for raw chicken. Couldn't ever bring myself to go back. Although I felt FDN fell short of Antico taste, the lunch special with salad was a tasty deal. Would I buy a FDN pie to take home and reheat or buy a reheated pie at a retail store? NO. The whole point of eating wood or coal fired pizza is to eat it right out of 900 degree oven. The charred crust doesn't taste the same when reheated. My favorite pie in Atlanta is Antico. In New York it has to be Lombardi's on Spring at Mott.